The original idea of genius refers to the natural spirit and inner qualities of a person; this includes their god-given talents as well as the way they are aimed at life. In that sense, everyone has a genius nature and something essential to give to the world. However, when neglected or rejected our natural genius can incite our worst inner demons. Please join us for an evening of stories and poems and discussion of the many ways that the genius in us keeps finding meaningful ways for us to change and to grow. 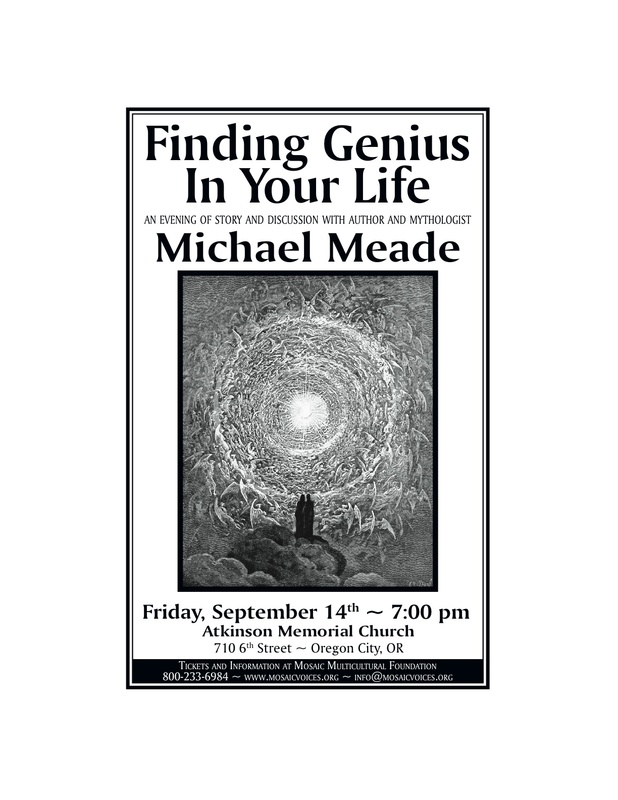 We hope you can attend this evening of story and discussion with Michael Meade. Friday September 14 at 7:00 pm. Here is the link for tickets and information. We appreciate your support and would like to ask you to help us by forwarding a link to this page to any groups or individuals who might benefit from this event. For more information and registration visit the Mosaic website at: www.mosaicvoices.org.